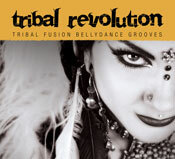 The constantly evolving world of Tribal Fusion Bellydance is known for its innovative artistry and emotive expressions. Combining the cultural with the mystical, the dark with the intimate; Tribal Revolution presents an unprecedented cast of Tribal Fusion artists. Movement inspired by the beautiful and underground meet enigmatic music from musicians such as: Solace, Mosavo, Dan Cantrell, Sxip Shirey and more!